By Lucie Sovová and Elske Hageraats (FEI coordinators ‘Stichting Boerengroep’). 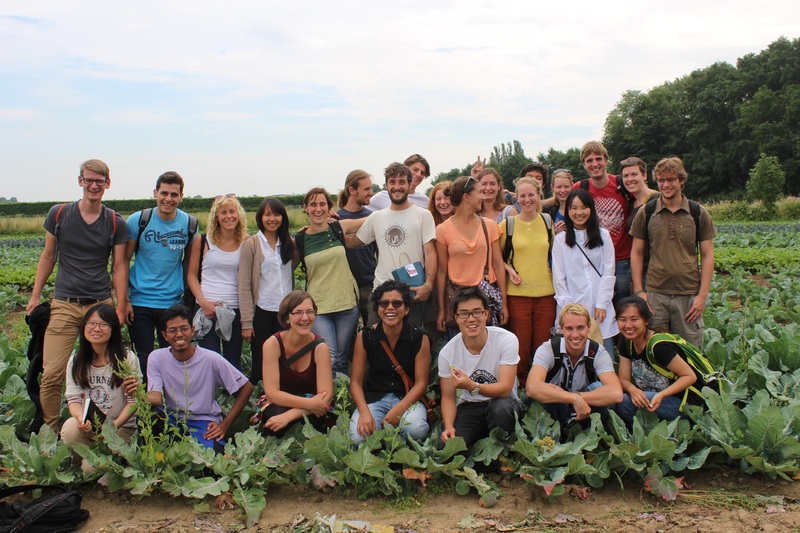 The Farm Experience Internship (FEI) is a 3ECTS summer course on agroecology that offers the students to get hands on experience from organic and bio-dynamic farms in the Netherlands. This year it took place from 20th of July till 14th of August. The main organizer of the course was Stichting Boerengroep with the academic support of the Rural Sociology Group. During the first week of the course, twenty-four participants of different nationalities and study backgrounds enjoyed lectures, workshops and excursions connected to the topic of sustainable food production. Around twenty speakers of different expertise came to Wageningen to share their knowledge with the participants. After learning about permaculture, food sovereignty, seeds, IPR, agriculture policies and other related topics, all the participants spent two weeks on a farm in the Netherlands to experience farmers’ work and lifestyle – this year, 17 farmers welcomed the participants (either individually or in small groups) in their homes. Finally, the students came back together to share, analyze and reflect on their experience, linking the newly gained practical insights back to their theoretical knowledge. The FEI is inspired by a Brazilian course Estágio Interdisciplinar de Vivência (EIV) and it was brought to the Netherlands in 2013 by a Brazilian student Heitor Mancini Teixeira. The course is recognized and supported by the Wageningen University, but it is still organized by students in a participatory, bottom-up manner. In this way, it also connects to the ideas of the New University movement and reclaiming the education. Inclusiveness, accessibility and diversity in learning processes are an important part of the FEI. For more information about the Farm Experience Internship and student experiences, click here. Click here to see the video of the FEI on Egypt Television (from 6:40). This entry was posted in Agriculture, Education, RSO-student and tagged Boerengroep, Farm Experience Internship, FEI 2015 by RSO-Students. Bookmark the permalink. Hi! I am a second year Masters’ Student of Sustainable Agriculture from Iowa State University, USA. I am interested in participating next year. Please let me know the selection process. Thanks very much!